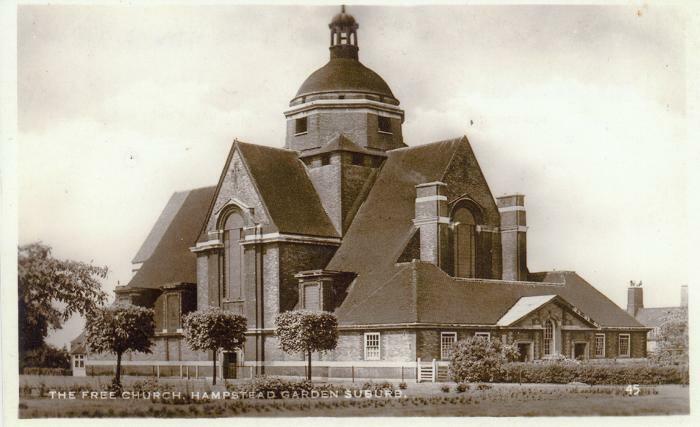 Postcards of the Free Church, forming part of the Raymond Lowe collection. common with St. Jude's. Building started in 1911; the foundation stones were laid on 16th March of that year. The first minister was the Rev. J. II Rushbrooke who was appointed in 1910. By 1912 the congregation nrmbered 170.The building has not the proportions of St. Jude's nor has the interior, the acoustic or the grandeur of its sister church. It is nevertheless also a Grade 1 building. The favourite viewpoint of the post card publishers would seem to be from the east end. Only after the completion of the west end in 1961 does the most rescent card show that view.